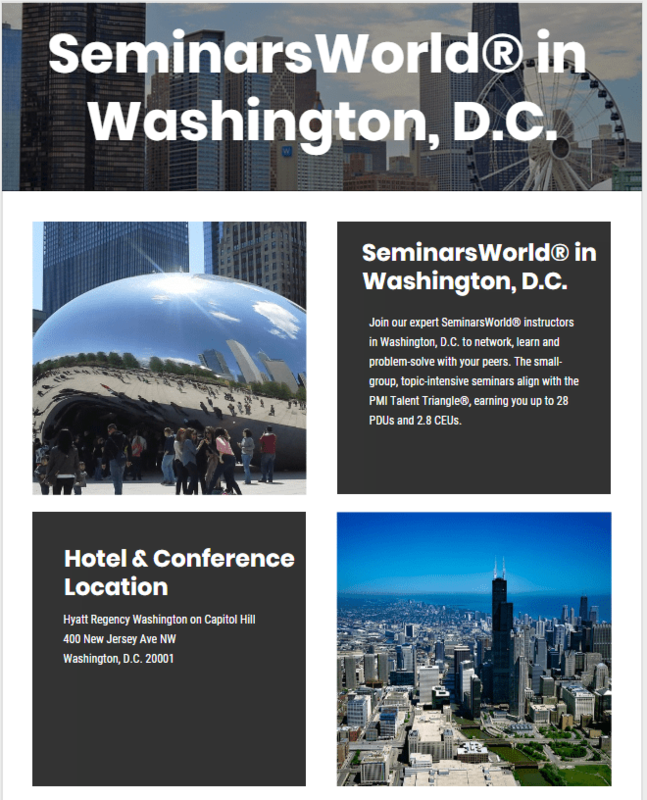 Home EVENTS SeminarsWorld in Washington, D.C.
Join our expert SeminarsWorld in Washington, D.C. to network and learn with your peers in small-group, topic-intensive seminars aligned with the PMI Talent Triangle®, while you earn up to 28 PDUs and 2.8 Continuing Education Units. Register by 16 July for early bird rates, and through 6 August, save on guest rooms at the Hyatt Regency Washington on Capitol Hill. Registration includes breakfast and lunch. SeminarsWorld runs from 8:00 a.m. – 4:00 p.m.
Make reservations early, as rooms tend to sell out quickly. Call the hotel directly at +1 888 421 1442 to make a reservation. Be sure to mention Project Management Institute to receive the SeminarsWorld rate. For online reservations, click on the “book your room” button. Any organization registering a group of at least 3 individuals to a specific SeminarsWorld® location is eligible to send one additional registrant to a seminar at the same location at no cost.